Actinidia. (From Greek aktis, a ray, alluding to the styles which radiate like spokes of a wheel.) Actinidiaceae. Some 40 species of scandent shrubs, mostly dioecious, deciduous, with a solid or lamellate pith. Leaves alternate, simple, dentate, long-petiolate. Flowers solitary or in axillary cymes, usually white; sepals and petals usually 5; stamens numerous, anthers often purple or yellow. Fruit a many-seeded berry. E Asia. Several subspecies are grown for their edible fruits and in China, where they are known as yang-tao, they have been cultivated since 770AD. 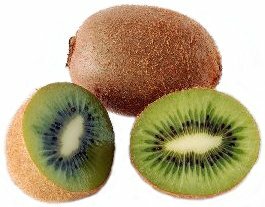 Actinidia deliciosa, the kiwi fruit, is grown for its egg-shaped, bristly fruit, their sweet, translucent green flesh perfumed rather like a strawberry, flavour rather like a muscat grape. It is also a handsome ornamental with downy young growth and in summer, cup-shaped white flowers to 4cm across. It was introduced to Britain by Robert Fortune in 1847. It arrived in New Zealand, now a major producer, in 1906, and although the first export consignment did not reach Britain until 1953, it has rapidly become commonplace in Western supermarkets. It is also grown in subtropical and warm temperate regions of France, Italy, Australia, South Africa, Israel, the US, Chile and Japan. When dormant, it is known to withstand temperatures of –8ºC, although young growth will suffer severe damage at only –2ºC. To fruit well they require winter chilling to induce flower development (06:00 to 11:00hrs below 7ºC), a frost-free period of growth of 8-9 months, and a long, warm and sunny summer, to ripen fruit. Vines begin to bear 2-4 years after planting and may continue to produce for 40 years and more. Male and female plants are required for pollination, at a ratio of 1:7; where space is limited, plant a female on to which a small male branch has been grafted. Pollination is by insects, or by hand when grown under glass. In temperate climates, most Actinidia subspecies are probably better known as ornamentals, strongly twining climbers used as wall plants or to scramble through old trees. Actinidia kolomikta has heart-shaped leaves, emerging chocolate and lime green, their tips beautifully splashed with cream and pink; male plants are reputed to have better variegations, especially on soils with some lime. Some subspecies, such as Actinidia kolomikta and Actinidia polygama, are attractive to cats, in a similar fashion to Nepeta, and should be protected from their attentions when young. The foliage of the silver vine, Actinidia polygama, bronzed when young, later develops silvery or creamy variegation and bears fragrant blooms in summer; it may later bear yellow fruit, edible but not well flavoured. Both withstand temperatures of at least –17ºC. Plant all species in deep and well-drained loamy soils, rich in organic matter, preferably neutral, although they will tolerate a range of pH. Actinidia grow well in part shade, but if cultivated for fruit, site in full sun with shelter from wind, which will snap and bruise young growth, and will cause wind scar in the fruits. In regions experiencing only light frosts. Actinidia deliciosa may be grown on a south-facing or west-facing wall. Where space is limited, prune ornamentals in winter. In cool-temperate climates, Actinidia deliciosa requires the protection of the cool glasshouse (minimum 7ºC), if grown for fruit. Plant in the dormant season into the greenhouse border or in large pots of medium-fertility loam-based mix. Cut back to 30cm after planting, and train on to a strong trellis or wires; create a well-spaced framework by tipping back when the vine has reached the required height and training laterals horizontally, stopping them when they fill the allocated space. Bearing begins in the third year, on laterals that emerge from the main framework. Restrict these to seven nodes beyond the fruit, and remove any subsequent sub-laterals. Feed weekly during the growing season. Thin established plants in winter, and renew three-year-old fruiting laterals by cutting back to a dormant bud. 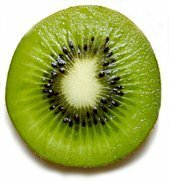 Kiwi fruits are very sensitive to ethylene, and must be stored apart from fruits which produce it. 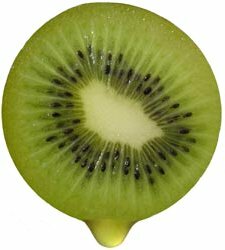 Under commercial conditions, kiwis have a potential storage life of nine months at freezing point and with relative humidity of 90%, but domestically, 4-6 weeks post-harvest storage is optimal for after-ripening and development of flavour. Propagate cultivars from semi-ripe cuttings taken in late summer, in a closed case with bottom heat of 20-25ºC. Also by layering in winter. Sow seed in spring or autumn; seedlings are variable and in Actinidia deliciosa appear to be predominently male, and deviating. Commercially, selected cultivars are grafted (cleft or whip-and-tongue grafts) on to seedling rootstock. In temperate climates, Actinidia is generally free from serious pests and diseases. In warmer regions, especially in fruit-producing areas, they may be attacked by leafroller caterpillars, greedy scale, thrips, passion-vine hopper and rootknot eelworm, and may suffer from botrytis (Pseudomonas viridiflava), bacterial blossom rot (Sclerotinia subspecies) and Phytophthora. TARA VINE; YANG-TAO. Shrub with a white to brown, lamellate pith. Leaves to 15cm, soft, smooth, mid-green, broadly ovate to ovate-oblong, base cordate to rounded, sharply dentate; petiole to 7.5cm. Flowers to 2.5cm diameter, in axillary racemes, white, fragrant; petals orbicular, concave; anthers deep purple. Fruit to 2.5cm diameter, oblong to subglobose, fleshy, yellow-green, edible. Temperate E Asia. ‘Ananasnaya’: very hardy, vigorous; flowers attractive, fragrant; fruit small in large clusters. ‘Issai’: self-fertile. ‘Meader Female’: female clone, to be pollinated by ‘Male’ or ‘Meader Male’. Z4. Shrub to 10m, with a lamellate pith. Leaves to 13cm, glabrous, ovate to oblong, rounded to cuneate at base finely dentate; petiole to 6.5cm. Flowers to 2.5cm diameter, white or cream-white, solitary or in axillary cymes; anthers yellow. Fruit to 2.5cm, ovoid, green, spotted and tinged red. E Asia. Z7. Shrub to 8m with a solid, white or yellow pith. Leaves to 15cm, coriaceous, glabrous, oblong to ovate-oblong or lanceolate, base cuneate to subcordate, sharply dentate, pale green beneath; petiole to 2.5cm. Flowers to 2cm, solitary or in axillary racemes, red; petals concave; anthers yellow. Fruit to 2cm diameter, brown, ovoid to globose. China. Z6. 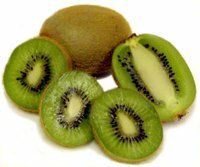 KIWI FRUIT; CHINESE GOOSEBERRY; YANGTAO. Vigorous shrub to 10m with a lamellate pith; shoots red-pubescent. Leaves to 20cm, cordate, ciliate, densely pilose beneath. Flowers to 4cm diameter, cream-white becoming yellow, borne on axillary branches. Fruit to 6.5cm, oblong-globose or ellipsoid, densely hispidulous, edible. China. ‘Blake’: fast-cropping and self-fertile; recommended for smaller gardens. ‘Tomuri’: stems red, hairy; leaves oval, dark green; flowers less abundant, large, cream. Late flowering. Commercially, female cultivars like ‘Bruno’ (fruit elongated) and ‘Hayward’ (fruit large) are used, with male pollinators such as ‘Male’, ‘Mutua’ and ‘Tomuri’ included in plantations. Z7. Shrub to 7m, with a brown lamellate pith. Leaves to 15cm, membraneous, glabrous, ovate to ovate-oblong, base cordate to rounded, pale green beneath, splashed and banded chocolate, white and pink above; petiole to 3cm. Flowers to 15cm diameter, white, fragrant; anthers yellow. Fruit to 2.5cm, ovoid-globose, yellow. Temperate E Asia. ‘Arctic Beauty’: very hardy; leaves to 12cm, opening purple, mature to combination of pink, white and green; flowers small, white, fragrant. ‘Arnold Arboretum’: sweet, small-fruited. ‘Krupnoplodnaya’: hardy; leaves red in summer. These females can be pollinated by male ‘All-Purpose’. Z4. Shrub with brown lamellate pith. Leaves to 6.5cm, papery, ovate-lanceolate or lanceolate, puberulent above, white-stellose beneath; petioles to 15mm. Flowers to 10mm diameter, green, in axillary cymes; anthers yellow. Fruit to 10mm, ovoid, China. Z6. Shrub with white, lamellate pith. Leaves to 9cm, papery, ovate to ovate-oblong, base rounded or cuneate, glabrous above, with tufts of rusty hairs in vein axils beneath. Flowers to 2.5cm diameter, white, unisexual, solitary or in axillary cymes; anthers purple. Fruit to 3cm, ovoid, glabrous, red-brown. Japan, China. Z6. SILVER VINE. Shrub to 6.5m, with a white, solid pith. Leaves to 15cm, ovate or ovate-oblong, base rounded to subcordate, sometimes sivery-white or yellow above; petioles to 3cm. Flowers to 2.5cm diameter, solitary or in clusters of 2 or 3, white, fragrant; anthers yellow. Fruit to 2.5cm diameter, ovoid-globose, yellow, edible. Temperate E Asia. Z4. Resembles Actinidia arguta except leaves longer, narrower. Flowers to 15mm diameter. Fruit ovoid-oblong, flushed purple, sweet tasting. China. Z6.